Here are few ideas for adding a Middle Earth look to any bedroom! 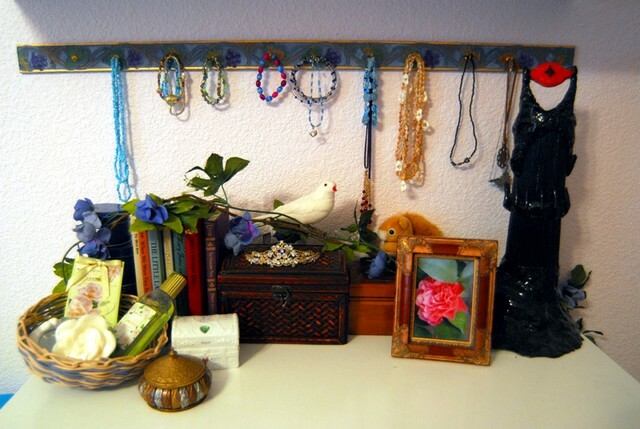 Add a touch Elven of elegance with this easy to make jewelry hanger. First, sand the edges of the wood strip until smooth. Next, paint the wood with the acrylic paints. Let dry for 15-30 minutes. Add hints of the gold liquid on edges of the leaves using your finger or a Q-tip. Let dry for at least 15 minutes. Then screw in the hooks 1-2 inches apart. Hang by screwing into the wall. I made this as a decoration for my J. R. R. Tolkien/Lord of the Rings report and now it makes a cool piece for my bedroom. Use whatever supplies you can find. I used foil for the inside shape then covered it with clay. For the middle I used thin corrugated cardboard. For the upper ridges I found craft sticks and cut them to the right size (Warning: You need a lot of sticks). For the sides at the very top of the tower, I made a foil triangle shape and then covered it heavily with clay. To make the Eye, I formed a clay ball and pinched the edges to the shape I wanted. Then I stuck the shape to each side. If it needs more support run a medium size wire through the eye and into the sides. I glued the bottom of the tower to cardboard and covered it with thick foil to make a mountain. I used clay to make designs on the tower. When I was done adding clay I followed the instructions on my clay package for baking. I let it cool for 2 hours. Finally, I sprayed the whole tower with black spray paint. Later when it was dry I painted the Eye. Paint whatever you want, IF it is something from nature. Take pictures of flowers, vines, leaves, birds and animals. Draw them VERY lightly with pencil on the paper. Then use the pastel watercolor paints to add light colors. Use sponges and salt to add texture. Frame and display! Pillows are a great and inexpensive (if homemade) way to convey a Middle Earth theme. For a Shire theme: Use warm colors like soft greens, pinks, purples and yellows. First, buy or create a simple pillowcase or pillow pattern. Second, buy fabrics at a fabric or discount store (If you are ok with using cheaper quality fabrics be sure to check the Wal-Mart dollar rack). Third, sew pillowcases either by hand or using a machine (I recommend using a sewing machine. if you don’t own one see if you can borrow one form a friend). If you wish you can add lace or ribbon to the edges of your pillowcase. If you have leftover material you can make mini pillowcases or pillows. Here is a picture of my dresser. I displayed my Barad-dur tower and my Elven necklace hanger here and some other things like antiques and fake flower vines. Note: You can buy fake vines at the dollar store and decorate almost anything: dressers, mirrors, desks, head boards and more! I agree 100% with GotPrecious. This is amazing! Thanks a bunch!! This is very cool! I like this. Hannon le! Amazing ideas, I was looking for something just like this! Excellent work. That tower is exceptional!!! Is orange a middle-earth colour and if is what does it represent?